Strawberry cupcakes were one of the first gluten-free cupcake recipes I attempted to make. The first time I attempt, well, they ended up looking like they were cooked with a golf ball in the center. They sunk almost to the bottom of the cupcake tins. Okay, maybe not that bad, but they required a ridiculous amount of frosting to hide it. One good thing though, I was able to get the texture right, and texture is such a hard thing to get with gluten-free baked goods. After researching online about sinking gluten-free cupcakes, I found that I was not the only one who suffered from that ‘sinking feeling.’ Two of the common culprits: over-mixing, and over-leavening. If you add too much leavening (baking powder and/or baking soda) it causes cupcakes to do the opposite of its intended purpose? Crazy, I know, but true. So after adjusting the amount of baking powder, as well as changing the technic for mixing to help prevent over-mixing. The result was delicious, and to make it even better? Add a filling, and what better filling than a lemon curd to make for a strawberry lemonade flavor. In a small pot, whisk together the coconut milk and corn starch. Place over medium heat. Whisk in the lemon juice, sugar and salt. Whisk every minute or so, then whisk constantly once the mixture starts to bubble around the edges of the pot. When mixture starts to thicken and bubble constantly, whisk for a few minutes and then remove pot from the heat. Whisk in the zest and margarine until fully combined and place on the counter to cool. Every five minutes or so, whisk the mixture. When mixture has cooled down a bit, pour into a bowl, cover with plastic wrap, and push the plastic wrap onto the surface of the curd (to prevent a skin from forming), and refrigerate for at least 3 hours. Preheat oven to 350 degrees. Place cupcake liners in muffin tin. Place frozen strawberries in microwave-safe bowl, cover and microwave until strawberries and soft and have released their juices, about 4-5 minutes. Place in fine-mesh strainer set over a small saucepan. Firmly press fruit dry (you should have at least ¾ of a cup of juice). Reserve strawberry solids for the frosting. Bring juice to boil over medium-high heat and cook, stirring occasionally until reduced to ¼ cup, about 8 minutes. Whisk So Delicious Coconut Milk, egg replacer, and vanilla into juice until combined. In a small bowl, mix brown rice flour, sorghum flour, potato starch, tapioca starch, xanthum gum, baking powder, and salt together. In a large bowl, whisk sugar and strawberry milk mixture together. Slowly whisk in melted margarine, until combined. Fold in dry ingredients until combined. 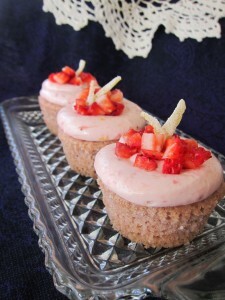 Fill cupcake liners ⅔ full and bake until toothpick inserted in the center comes out clean, 18-20 minutes. Cool cupcakes in pan on a wire rack for 10 minutes before removing them from the pan, and cool completely. While cupcakes are cooking, prepare frosting. Using a hand mixer, beat shortening, vegan cream cheese, and salt. Mix in ½ cup of reserved strawberry solids and lemon zest. Beat in powdered sugar until combined. Refrigerate until cupcakes are cooled completely. 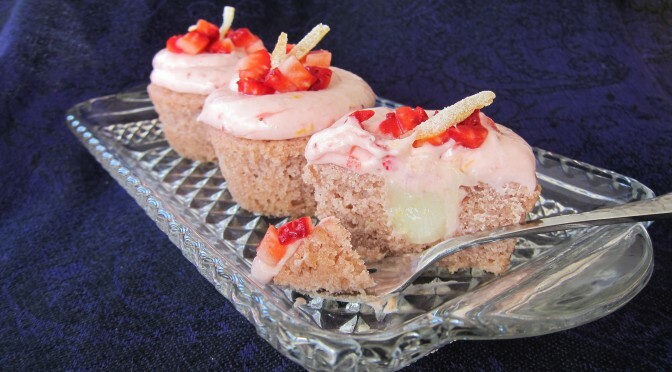 Using a melon baller or apple corer, remove a portion of the center from the top of the cupcake, being careful not to go through the bottom of the cupcake. Fill with curd. Frost cupcakes with desired amount of frosting (I find this works best when done with piping bag with a large round tip). Top with chopped strawberries and candied lemon peel. Enjoy!